There are two very large cables that come directly off the battery. Think of these cables as the large rivers that carry the water from the reservoir into a city's water main system. The negative cable is normally black, and the positive cable is normally red. The positive cable, normally red, divides into two very large sections. One section goes to the engine and under hood area. Its first stop is often the starter motor and then on to a main underhood electrical distribution center and fuse panel. Here the electrical power is divided into several fused or protected circuits, much like the main water pipes in a city water system with their gates and valves. The other section of the positive battery cable goes to the interior electrical distribution center. This is also a large, fused power distribution center that supplies the interior or passenger compartment electrical systems. There is also a smaller cable that goes directly from the alternator/battery output (B+) terminal directly to the positive terminal on the battery that supplies the electricity that charges the battery. The other very large battery cable is the negative cable, normally black. It provides the ground or return path to the battery so that all of the electrical circuits have a "pure" ground path to the battery. 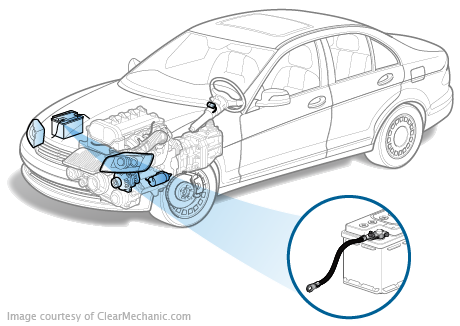 In many cases there are branches from the negative engine battery cable that attach to other under hood systems such as the fuel injection, ignition system, anti-lock braking system and transmission controls. Other smaller sections of the negative battery cable are attached to the body and frame of the vehicle. This allows for the interior and exterior lighting systems to have a clear return path to ground which is the negative terminal on the battery. It also provides a "pure" ground path to be used by other interior electrical systems though some interior electrical systems, such as the instrument panel, use individual or "dedicated" ground wires in order to have a "pure" and "noiseless" return path to the negative terminal on the battery.